About two thousand years ago, Pedanius Dioscorides, a physician traveling throughout the Roman Empire with Emperor Nero's army, would collect samples of the local medicinal herbs everywhere he went. He turned his passion for plants and other medicinal substances into a monumental reference work on herbs and pharmacy that remained the supreme authority on the subject for over 1500 years. In 70 A.D., Dioscorides published De Materia Medica, or, "On Medicinal Substances" in five volumes. Translated into several languages both ancient and modern, and later supplemented with commentary by European, Middle Eastern, and Indian authors, it has been the prime authority and source work on herbs and other medicinal substances in the history of Western Civilization, and quite possibly in the history of the world. Pedanius Dioscorides was born around 30 A.D. in the town of Anazarbius in Asia Minor, in present day Turkey. He started work on De Materia Medica around 50 A.D. and published it in 70 A.D. 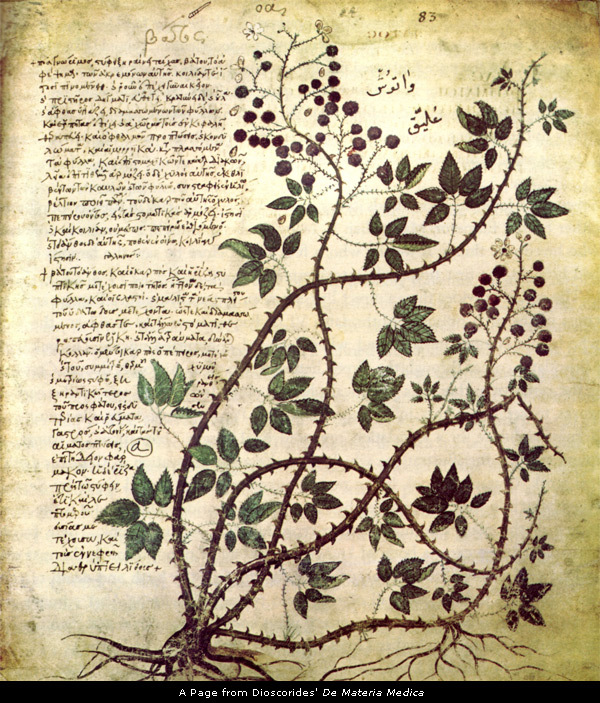 Although he wrote his herbal in Greek, it was quickly translated into Latin, and subsequently into Arabic and other languages. Dioscorides died aroung 90 A.D.
Dioscorides' great herbal is one of the most popular medical reference works in the history of mankind. Unlike other medical works by classical authors, De Materia Medica wasn't rediscovered in the Renaissance because it had never really left circulation. In sheer scale and thoroughness, De Materia Medica vastly surpassed all previous herbals. It discusses the medicinal properties of over one thousand natural medicinal substances; most of these are botanical in origin, but drugs of animal and mineral origin were also included. To put things in perspective, the entire Hippocratic Corpus only mentions about 130 different medicinal substances. Dioscorides listed over 4,740 different uses for the materia medica in his herbal, and lists over 360 varieties of medicinal actions. Dioscorides' herbal was qualitatively superior as well. 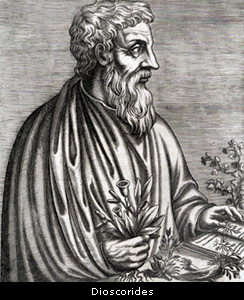 In writing nd compiling De Materia Medica, Dioscorides wanted to avoid the faults of his predecessors: incomprehensiveness, mistaken information, confusion of drug identities, too little testing and verification of drug properties, lack of emphasis on experimental data, and poor organization. De Materia Medica's subtitle, "On the Preparation, Properties and Testing of Drugs", sets the empirical, scientific tone of this work. Dioscorides didn't accept anything on faith, or on the reputation of established authorities; he checked everything out, and tested every drug clinically. He personally traveled and researched the local folk medicine uses of every herb. Dioscorides was the first to organize the materia medica into therapeutic groupings of drugs, based on similarities of medicinal action. This organizational format linked the science of pharmacy with the science of medicine. It also provided for the orderly placement of future drugs, once discovered, within this therapeutic organizational framework. Dioscorides also maintained that his organizational format, once learned, woud faclitate the learning and retention of pharmacological knowledge. When we consider that even the traditional Chinese herbal materia medica is organized according to similar therapeutic groupings of herbs, we can see exactly how influential and far-reaching were Dioscorides' revolutionary new ideas. Dioscorides' therapeutic groupings by medicinal action have a dynamic, kinetic character: Warming, Binding, Softening, Drying, Cooling, Concocting, Relaxing, Nourishing and the like. The Chinese materia medica, on the other hand, therapeutically divides medicinal actions into three broad categories: Eliminative, Regulating, and Supplementing, or Tonic; these are divided into various subgroupings according to what is being eliminated, regulated or supplemented. The presentations of every herb and medicinal substance in Dioscorides' herbal was very thorough. It included plant names, synonyms and illustrations; plant habitat and botanical descriptions; properties, actions and uses of the drug; negative side effects, if any; administration and dosage recommendations; directions on harvesting, preparation and storage of herbs or drugs; possible adulterations and how they're detected; and the veterinary uses of the drug or herb, if any. Why read Dioscorides' herbal today? Historically, it was the predecessor of all modern pharmacopeias. But beyond its historical importance, it also gives knowledge of the herbs and remedies used by the Greeks, Romans and other peoples of antiquity, remedies that can still be used today. A whole website devoted to Dioscorides and his herbal. In the article entitled The Herbal Tradition, quite a bit of information is given about Dioscorides and his De Materia Medica in the section on Roman Medicine.